Cross-posted with permission from Feminist Reflections. In my introduction to Sociology class, I use trends in baby names to introduce students to sociological research and inquiry. It’s a fun way to show students just how much we can learn from what might feel like idiosyncratic details of our lives. I start by showing students the top 10 boy and girl names from the most recent year of data available (along with their relative frequencies). After this, I show them the most popular names and their relative frequencies from 100 years earlier. There are some names on both lists; but for the most part, the names on the latter list sound “old” to students. If you’re interested, someone produced these two GIF files that depict the most popular names by state between 1960 and 2012. I like to show one of these while I’m talking with students about what what names can help us learn. I ask students to raise their hand when they see their own name or the name of their best friend. As we get into the 80’s and 90’s, lots of hands start going up. But the GIFs are also interesting because they are a powerful visualization of the spread of cultural norms. Popular names move through a population in a way that appears to be similar to infectious diseases. This is a fun way to show students that deciding what to name a child might feel like a personal decision, it’s actually a decision that is shaped by social forces. Names and name trends are great examples of what sociology can reveal because, as Stanley Lieberson points out so simply, while taste in most elements of culture is not a requirement, everyone has tastes in names. And, as it turns out, we can learn a lot about a society just by looking at patterns in which names we select for our children (and equally important are the types of names different groups tend to avoid). SIDENOTE: I like to highlight a great finding by Stanley Lieberson, Susan Dumais, and Shyon Baumann from their article on trends in androgynous names (here). Androgynous names are names that are given to both boys and girls–think Taylor, Cameron, or Casey for current examples. Lieberson, Dumais, and Baumann found that androgynous names follow an incredibly common pattern once they achieve a critical level of popularity: they become girl names and become dramatically less common names for boys–a powerful example of the stigma associated with femininity for boys. Yet, this appears to be one costs of privilege that has decreased. In 1880, the top 10 boy names accounted for 41.26% of all boys born that year; the top 10 girl names accounted for 22.98%. There was more than an 18% gap. 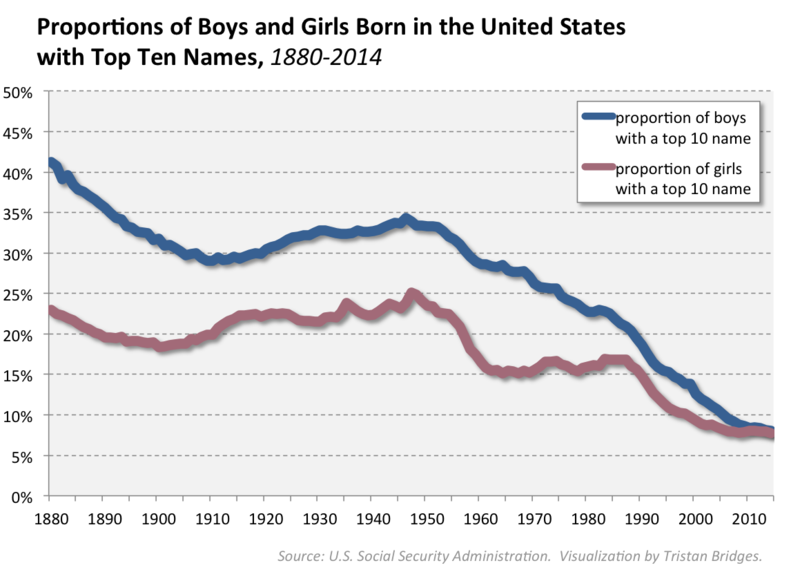 While boys’ popular names are still more popular than girls’ popular names, the gap shrunk to 0.27% by 2014. That’s a monumental shift. And I’m sure the modernization theory of name trends accounts for the lion’s share of the more general shift toward more secular names and a general decrease in name continuity between fathers and sons. But there is more than one way to read this shift. We might also say that this is a really simple illustration of one way that patriarchal family traditions have been chipped away over the past 100 years. Lots of data would support this conclusion. We might account for it alongside, for instance, data showing the prevalence of women taking men’s surnames after marriage as a percentage of all marriages in a given year or opinions about surname change. But it’s also an illustration of the ways that this process has meant changes for boys and men as well. Masculinity has, quite literally, opened up. It’s something that has happened more for some racial and class groups than others. And whether this transformation–this “opening up”–is a sign of gender inequality being successfully challenged or reproduced in new and less easily recognizable ways is the subject of my favorite corner of the field. Previous Post Fix your Face!